Sometimes the joy of a split is found in bringing together two bands that sonically differ but still share an aesthetical understanding. 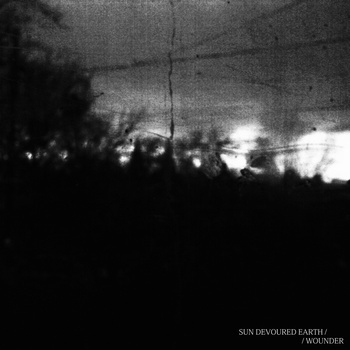 Latvian dark shoegazers Sun Devoured Earth and the UK’s depressive rock outfit Wounder, with dabbles of black metal, have created one such instance. The former muscle large, imposing walls of sound; yes, it’s a clichéd description at this stage but true. The latter on the other hand, as “depressive” would hint, delve into the murkiest depths. Despite those differences the bands still revolve their aural aesthetics around bleak, melancholic atmosphere. Sun Devoured Earth create harsh dirges, festering with gloom. It’s a sound that is by no means new, rather treading in familiar realms but still managing to keep their side of the split interesting in some ways. First track proper, ‘How Hard We’ve Tried’ captures the essence of the band with spectral vocals that at time can almost be inaudible, lost in the wash of atmospherics, which is contrasted by the faint post-punk of ‘Bright Days’. Wounder on the other side serve equal levels of palpable dejection. Vocally, they’re quite similar to Sun Devoured Earth and there are moments that recall Mortifera in their slow harrowing waves of guitars but so often the harsh noisy moments scream out for some intense searing BM-esque screeches and wails to pierce through the eerie melodic soundscapes. Instead, the monotonous clean vocals can become dreary, and not in the oh-so-right sense that a release like this aims for. This is heard on the drab side opener of ‘Leave Me Swinging’. Instrumental, ‘Filth’ has more of the palpable energy and intensity that we yearn for with towering guitars and unremitting drum hammering that soon descend into some beautifully hypnotic and serene passages. ‘Cleaner’ then is another rich instrumental track, dripping with despondency, it’s around now it becomes rather clear that this band’s greatest strength is conjuring evocative soundscapes, sans vocals. End of My Days further proves this, bringing their side to a close. This is a split with some merit to be found but both bands have their flaws too. However, what they do with their future respective releases may be expanded upon, with the foundations laid here.